iMacsoft DVD to PSP Converter is powerful and easy-to-use DVD to PSP and DVD to PS3 converter software designed just for Windows users to convert DVD to PSP, rip DVD to PS3, convert DVD movie to PSP with high DVD ripping speed. iMacsoft DVD to PSP Converter can not only convert DVD to PSP MP4, PSP H.264/MPEG-4 AVC, PS3 MPEG-4 and PS3 H.264/MPEG-4 AVC High-Definition (480P,720P and 1080P) video formats, but also extract audio track from DVD to PSP and PS3 MP3, AAC audio formats with high sound and image quality. 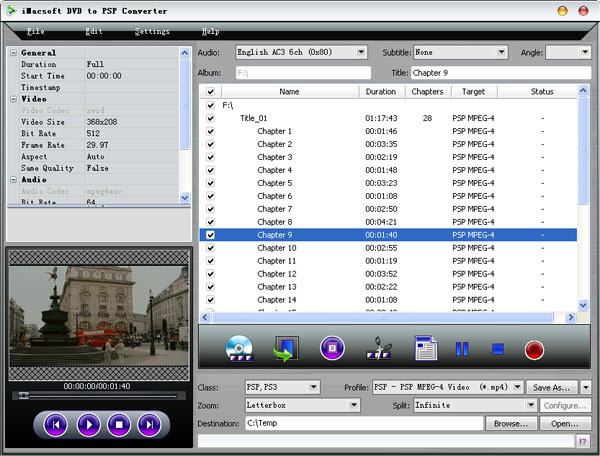 Compared with other DVD to PSP Converter, iMacsoft DVD to PSP Converter is more popular because it provides various settings which allow you to customize file size, split output file, select audio track and subtitle, rip DVD audio clips and adjust video and audio parameters like bit rate, sample rate, resolution, frame rate, etc. It is so convenient to put your favorite movies in your PSP and watch them on train, plane, or automobile anytime. Make your PSP player a wide screen movie player with iMacsoft DVD to PSP Converter!